Sometimes I worry about how often my kids are sitting in the car. Especially my younger son – he gets dragged to a lot of his big brother’s activities and often has to ride along when I’m driving the carpool or running errands. 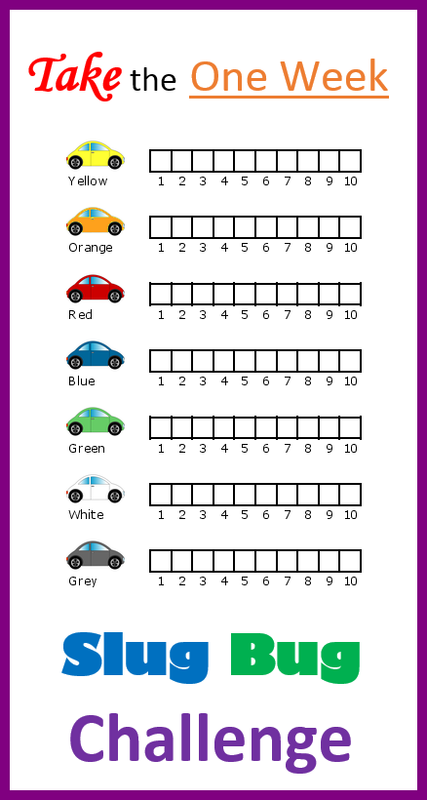 We love to play word and number games in the car, but sometimes we want to spice it up a bit. This One Week Slug Bug Challenge is lots of fun, and educational too! Have each family member who is going to participate make a prediction about which color will be seen the most often, and which will be seen the least often. Write down all the predictions on the back of the page so no one can cheat! For one week, watch for slug bugs on the road as you run errands, drive the carpool, go to school, etc. Each time you see a slug bug, fill in another box to record the sighting. At the end of the week, look at the data to find out which color slug bug is the most common, and which is the least common. See which family members guessed correctly! For added fun, ask a friend in another part of the country to do the same thing, and then compare notes. Are the same colors popular in different parts of the country? How to make predictions and record data for an experiment. SCIENCE! If you have fun with this, or have any added suggestions, email me at molly@thetripclip.com and tell me about it!